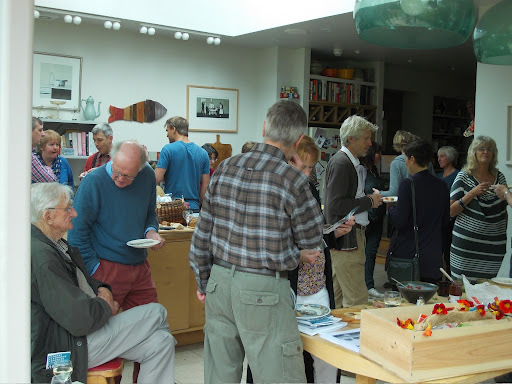 The Bread Circle met at the home of Sheep’s Head Food this last Sunday afternoon and the opportunity was taken for friends to get together to share some good food, talk and to partake from the fridge full of cheese and smoked sausage. A large part of Saturday was spent in preparation. There was a trip to the butchers at the back of The International Store to buy chicken wings and livers. Then onto the grocers for a large bag of lemons. There was already some smoked cod’s roe in the back of the fridge I had picked up last week from Wards. The chicken wings were mixed with honey and Ras el Hannout spice (also picked up from The International Store) and left to marinade for a couple hours and then roasted until done and left to cool. The chicken livers were minced with some fried shallots and garlic to which I added some Calvados which had been lurking in the basement for years and another spice mix made up white peppercorns, cloves and nutmeg. That mixture was put into a couple of foil containers and went into the oven in a tray of boiling water for an hour. Once they were done I put a weight on top of them and they went into the fridge overnight. The cod’s roe was scooped out of its leathery skin and went into the magimix with six slices of stale bread which had been soaked in milk and squeezed out, some cloves of garlic were added together with a handful of parsley. Once the magimix was turned on I poured in a mixture of olive and sunflower oil until the mixture tasted slick and smooth. The lemons should have been unwaxed but it didn’t seem to make too much difference. We did them on Sunday morning. They were all peeled and three litres of boiling water was then poured over the peel together with half a bag of caster sugar. 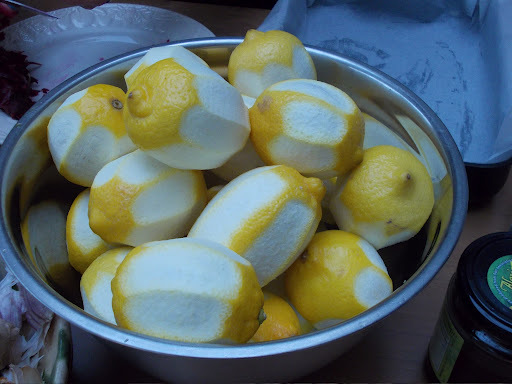 Whilst all that cooled the lemons were squeezed and the juice added to the peel and water before it was all strained into a great glass bowl. Halfway through Sunday morning we decided there was a need for another vegetarian option so there was another trip to The International Store to pick up three aubergines. 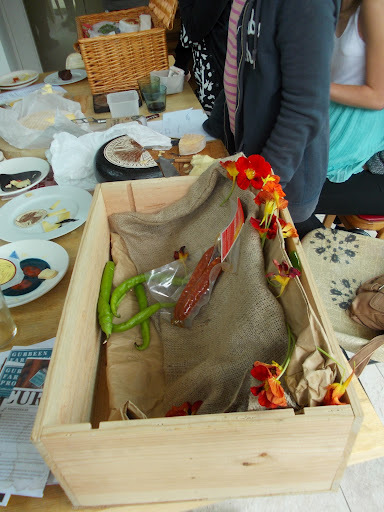 Those were roasted in the oven at the same time as Andrea and Cora cooked their beetroot and chocolate brownies. Once the aubergines were soft I let them cool and then peel off the skin. The flesh was then mixed with squashed garlic, Greek yogurt and olive oil until we were left with a smooth, unctuous cream that carried with it the tart kick of the garlic. Cora and I then laid out the wares. The sausages were presented in an old wine box left in the cellar for firewood. 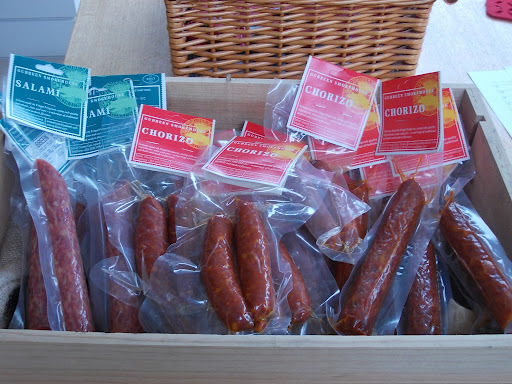 They were all from the Gubbeen Smokehouse and were a mixture of salami, chirizo and fresh chirizo. 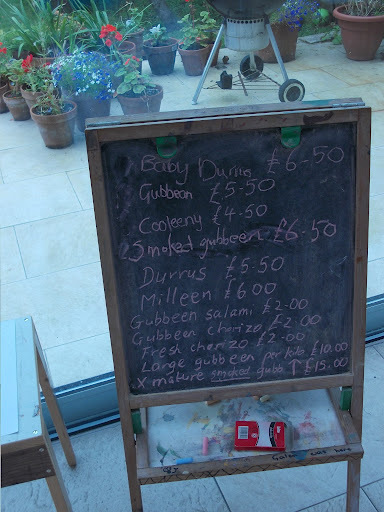 We had a large round of Extra Mature Smoked Gubbeen and a slightly smaller round of Gubbeen which were placed on wooden boards. 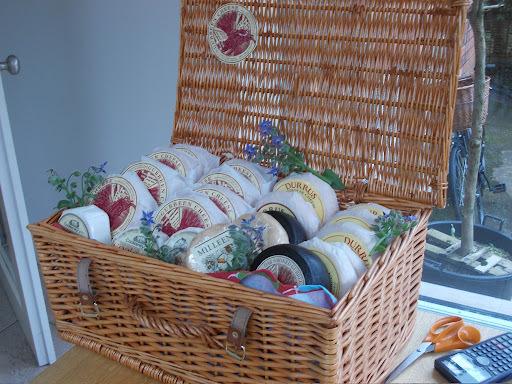 The rest of the small cheeses went into an old picnic basket. 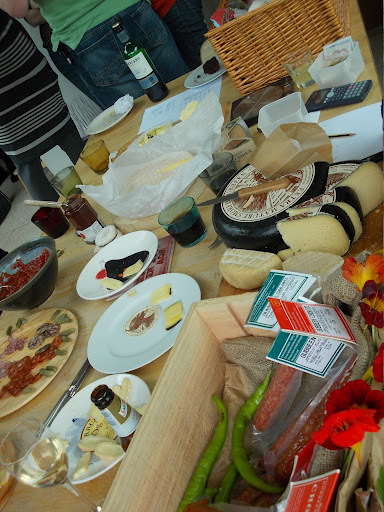 As well as the Gubbeen cheeses we had a couple of Milleen,three Cooleeney and some Durrus. A small but good selection of cheese from West Cork and the Cooleeney because it looked good on the stall at Bantry Market. 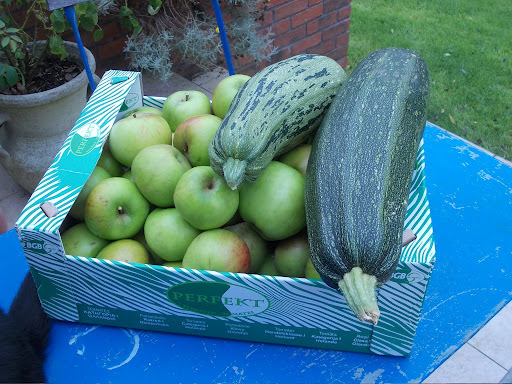 There was a box of windfall apples from the garden and two overgrown courgettes. Shortly before people started to arrive I sliced up a selection of the sausages and laid them out for tasting on a wooden plate. 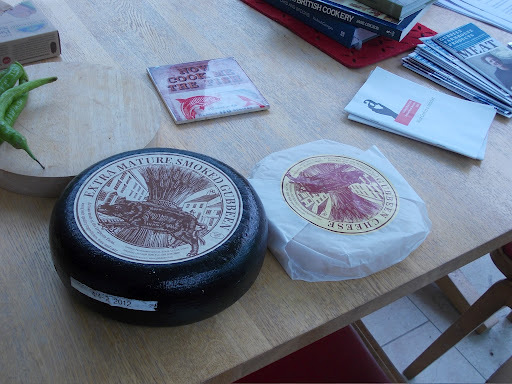 I then laid out sample plates of the cheeses each labelled with the name of the maker. People arrived from around 12.30. 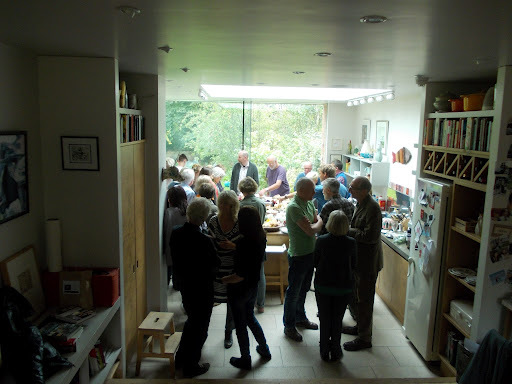 They made such a rush for the food that was laid out in the kitchen there wasn’t time take a photo. 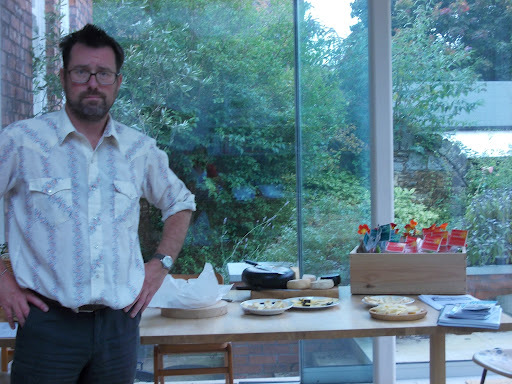 Steve came with a beautifully crafted soda bread he had been tending until the early hours of the morning. 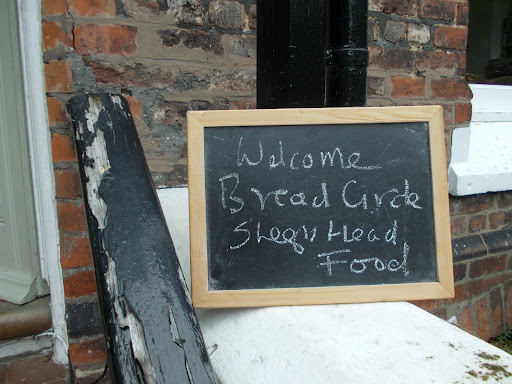 There was almost a small crisis when we learned that the Bread Circle’s oven was in difficulties and it was not clear that the meeting’s bread would be ready. But Michael was able to improvise and rescue the situation and Leo and Galen walked in with trays of the small loaves that had been made that morning together with tasting notes prepared by Michael. People took up their plates and the food started to go. Over the afternoon all the sausages were taken up along with most of the cheese. All we were left with were chunks of the large rounds of Gubbeen. Those will do for sandwiches in the week. Cora and Natasha manned the till, taking in the cash contributions, bagging and labelling the sausages and cheese and chasing people down with their change. If Sheep’s Head Food ever gets round to properly setting up shop it won’t have to far for good staff. I snaffled the last pack of fresh chorizo and hid it in the fridge. I will cook them next week with a bowl of lentils. Although I don’t think anyone could hear it we listened to Christy Moore.